Today’s blog is a two-fer because if you don’t like cabbage, or you don’t have a cabbage, or you’re sick of cabbage, you can substitute cucumbers and follow the exact same recipe. 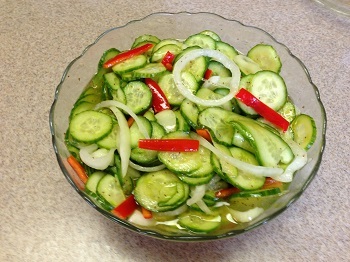 Use three large cucumbers, peeled and sliced thin, or two English cucumbers, which you can peel or not . I’ve been making this recipe for years. I adapted it from a recipe I clipped from a magazine. It’s attributed to “Mrs. McCollum.” I use about half the dressing originally called for, and it’s ample. You can adjust the amounts and use even less if you use less cabbage. You can substitute Splenda for the sugar with no ill effect (unless, like my kids, you think using Splenda in the first place is an ill effect). This salad will keep for two weeks or more in the refrigerator. 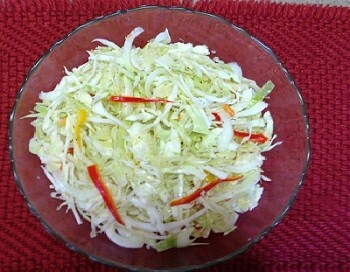 Pour the hot dressing over the cabbage and toss well to mix. Cool to room temperature, then cover and refrigerate until ready to serve. Plan to let it sit at least three hours before you serve it.